Of the famous American Turquoise mines the Lone Mountain Turquoise mine is considered to be in the top ten most famous. It produces some of the world's top spiderweb Turquoise gemstones. The Lone Mountain Turquoise mine, originally called the Blue Jay mine, is located near Tonapah, Nevada. The Lone Mountain Mine was first claimed by Lee Hand in 1920, but is now owned by Gene Wadell, and operated by Chris Lott. Though most of the Turquoise coming out of the Lone Mountain Turquoise mine today is of a clear blue natural or with very little matrix, the mine is actually famous for it's beautiful blue Spiderweb Turquoise. The Lone Mountain Spiderweb Turquoise which made the mine famous is a medium blue to a gray blue with black and mahogany brown fine spiderweb matrix. 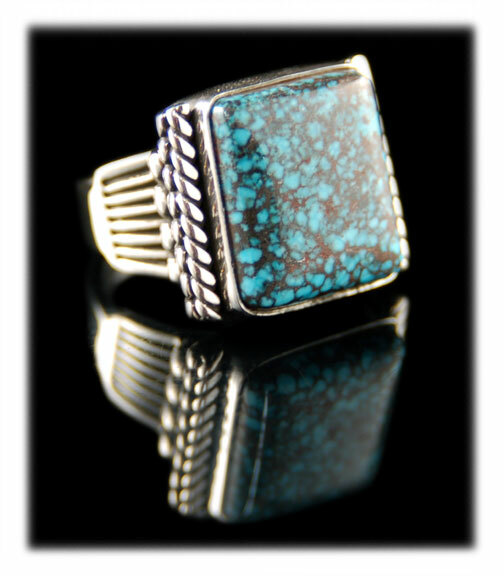 Lone Mountain Turquoise is noted for its ability to hold color and not fade. The mine has produced some of the highest quality spider web turquoise as well as beautiful lucid deep blue stone. The piece of jewelry and gemstones featured here show the beautiful color that is typical of the "finger print" look of Lone Mountain Spiderweb Turquoise that put the mine on the map, as well as the new material that is coming out. The ability that it has to retain its rich color makes this natural Lone Mountain Turquoise a valuable addition to any Turquoise Jewelry collection. This Lone Mountain Turquoise Gold Men's Ring was handcrafted in 14k Gold by Dillon Hartman of Durango Silver Company - Durango, Colorado USA. This Turquoise Gold Men's Ring features a beautiful Lone Mountain Turquoise Gemstone from the Lone Mountain Turquoise Mine of Nevada USA. The Gold work on this Gold Men's Ring is awesome as Dillon has created this Gold Ring as a heavy weight men's saddle type Ring that is handsomely fantastic and bold. 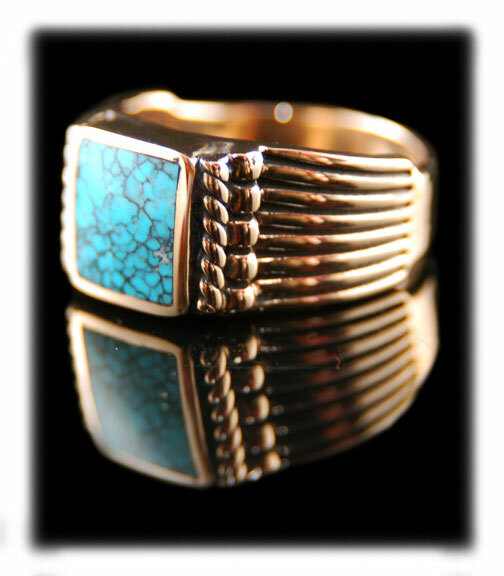 This Lone Mountain Turquoise Gold Men's Ring is a one-of-a-kind and there will not be another like this made. 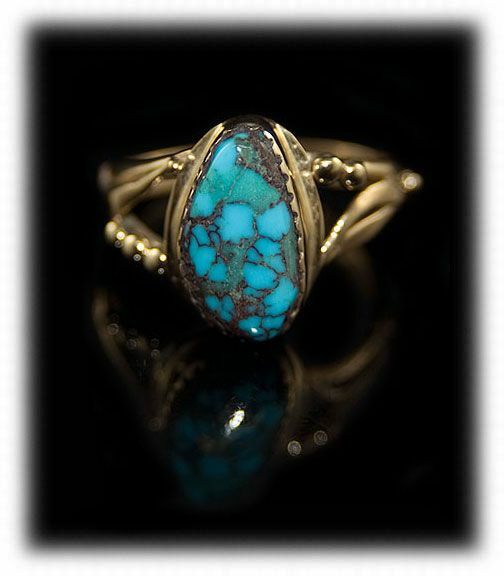 This is a Gold Turquoise Ring is way beyond a typical Men's Gold Turquoise Ring as it is heavy, exquisite style and features a rare Lone Mountain Spiderweb Turquoise Gemstone that is not often seen for sale. 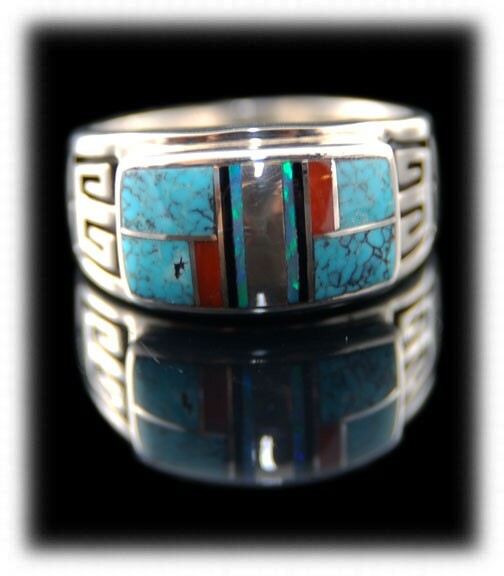 Lone Mountain Turquoise Gold Men's Ring by Dillon Hartman. A Lone Mountain Turquoise Gold Men's Ring by Dillon Hartman is a quality Gold Turquoise Ring that you can count on being world class and unusual from all other pieces in your Gold Jewelry collection. Dillon’s Gold Rings are all one-of-a-kind handcrafted Gold pieces that are Made in the USA and will become historic American heirlooms from the Southwest in the future. 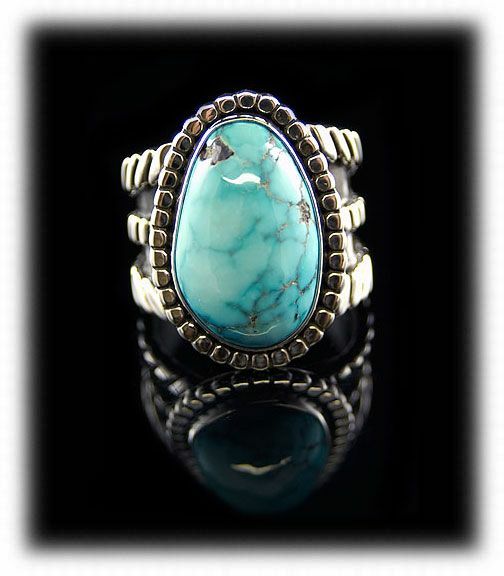 Above to the left is a beautiful Sterling Silver ring by John Hartman with gem grade Lone Mountain Spiderweb Turquoise from Nevada. In the center is a inlaid Sterling Silver ring with Lone Mountain Spiderweb Turquoise, Italian Coral, Fire Opal and Black Jade. To the right is a petite ladies 14k yellow gold ring with natural Lone Mountain Spiderweb Turquoise by John Hartman. These three examples show the differences in color of the Turquoise produced at the Lone Mountain mine as well as different spiderweb colors and patterns. The Lone Mountain turquoise mine is located in Esmeralda County, Nevada, not far from Tonopah. 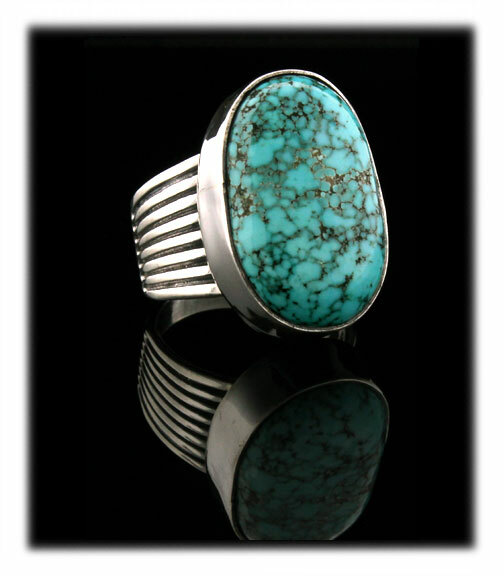 It has been one of the great producers of Nevada Turquoise. The color ranges from a beautiful clear blue to a dark blue spider web Turquoise. Lone Mountain has always been noted for holding its color. To this day jewelry can be found that was made in the 1930’s or 1940’s with Lone Mountain Spiderweb Turquoise just as blue as when it was made. To the left is a handmade Sterling Silver ring that features some of the newer natural Lone Mountain Turquoise that has come out within the last 5-10 years. This piece of Turquoise has water web matrix and beautiful pastel blue color to it. The mine was claimed by Lee Hand and named Blue Jay Mining Lode. Later, after seeing that so many mines had been named Blue Jay, Hand changed the mine’s name to Lone Mountain. In 1927 at a depth of about 40 feet Bert Kopenhaver, who had leased the mine from Hand, found the beautiful Spider Web Turquoise material that made Lone Mountain one of the top mines in the Southwest. Today, Lone Mountain’s beautiful blue spider web still gives Lander Blue, the most valuable Turquoise in the world, a run for its money. The mine has continued to change hands over the years and even now a small amount of good material is being produced. The mine has many rare occurrence such as the "fossil turquoise" finds in this mine. Plant fossils and sometimes seashells that have dissolved away leaving only the cavities were filled with Turquoise deposits which are usually Lone Mountain Spiderweb Turquoise. My favorite are the reeds that have been fossilized and make natural beads that already have wholes in them. Turquoise nuggets in moss agate have also been found.